Microsoft offers thousands of free templates on your Windows RT tablet for creating elaborate résumés, reports, invitations, schedules, calendars, and even stock reports that automatically create themselves when you type in a stock symbol. When the program appears, tap the template you’d like to open, and then tap Create to open the template. The figure lists just a few of the many free templates available, sorted by current popularity. During the holidays, you see more party invitations in Word, for example; in September, you see more templates for school activities. To see other popular templates in Excel, for example, scroll down the screen by dragging the scroll bar down the screen. Tap any template’s icon for a quick preview. If the current popular templates don’t meet your needs, move to Step 3. Search for an unlisted template by typing a keyword in the Search for Online Templates bar along the top and tapping Enter. When you see a template you want, tap the Create button to download the template and begin working. 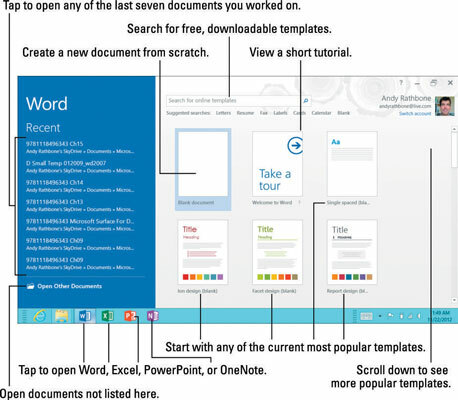 Microsoft offers thousands of free templates online, searchable by key word. Type Expense into the Search bar (or tap the word Expense beneath the bar), for example, and Excel shows hundreds of expense-related templates. Narrow your themes by choosing from the categorie. Expense-related templates, for example, appear in the categories of Monthly and Personal. 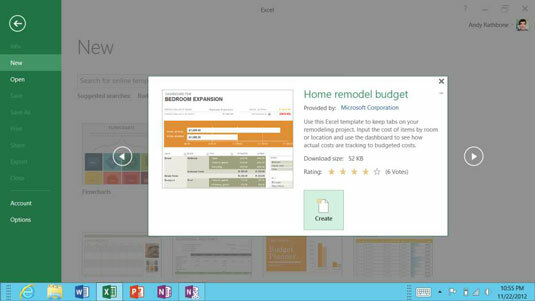 Tap a template to see a preview; tap the Create button to download and open the template. 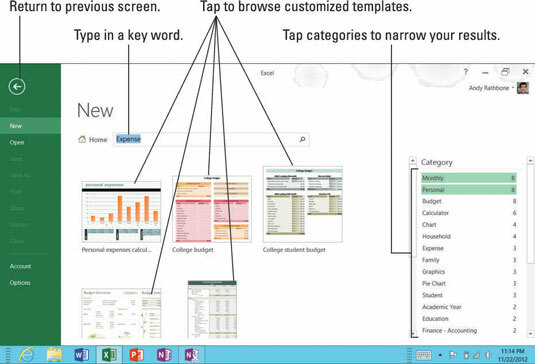 Word, Excel, and PowerPoint offer thousands of templates from a wide variety of categories. It’s much faster to adapt a template to meet your needs rather than starting from scratch. To save space, Microsoft didn’t bundle Office templates with tablets running Windows RT. You must be connected to the Internet to download them. Before beginning a project, spend some time browsing and downloading potential templates. That way, you can still work from a template when offline. When installing Microsoft Office on your Windows 8 tablet, be sure to install the optional templates. Most tablets running Windows 8 offer more storage than tablets running Windows RT. You can browse Microsoft’s templates with Internet Explorer. Templates you download await you in your Downloads folder, available in the Navigation pane along the left edge of every folder.